Stalled « Hudson River Historic Boat Restoration and Sailing Society Inc.
A surprise email in our inbox on December 22 informed us that we have to vacate our work site by the first of the New Year. We’re moving. Not far, but it’s enough to make us change course for about a month. Four nights worth of valuable Thursday volunteer hours will now be diverted to shoring up and moving the Eleanor who, with her stripped down hull and without a deck, is not in any condition to travel, even at a crawl, into the bay south of us at our restoration site. We’ve got a plan, and hopefully we will be able to use the new, improved crib on wheels to help us move Eleanor to the Hudson River when she is ready. We look forward to having a beer with our new neighbors, The Hudson Brewing Company. The once empty, now buzzing building, formerly the LB Furniture Building, later the Riverfront Industrial Park, and now The Warehouse at 99 South Third Street, has been our home since 2013. Once we are settled in our new site, we will embark on yet another phase of her restoration: designing, building and installing the garboard strakes — two long planks on either side of the keel that run from bow to stern. We look forward to getting back to our mission, getting Eleanor into the water once again. Thank you for hanging in there. We continue to appreciate everyone’s support and interest in this long and carefully thought-out restoration project. If you jumped ship while the going was slow, we’d like to welcome you back on board. 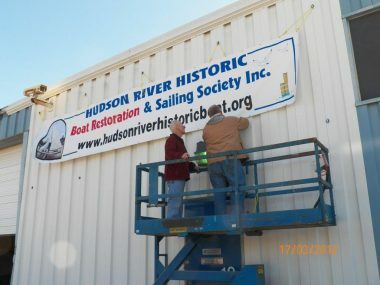 It’s a New Year and it will be an exciting one for the Hudson River Historic Boat Restoration & Sailing Society! 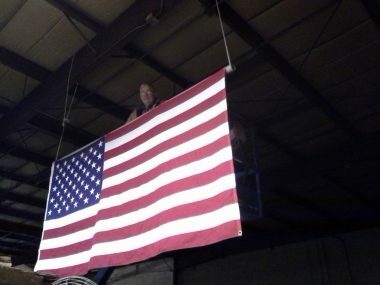 POSTSCRIPT: On Febrary 2, 2017 Joe Kenneally officially hung our memorial flag in our new location. This marked the end of the move and the beginning of back to work on Eleanor.